The Etsy shop Alilsumptinsumptin has beautiful one of a kind handmade jewelry. 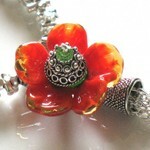 This jewelry features lampwork beads that are combined to make pieces that are truly unique. There is even a section of the shop dedicated to animal themed jewelry and 100% of the proceeds are donated to the Humane Society of the United States. Eva, the owner of Alilsumptinsumptin, says that one of her goals is to use her creative abilities in a positive way and to raise $1,500 for the Humane Society by the end of the year. It looks like she is well on her with over $1,000 already donated. Eva has been creating her jewelry for the past 3 years and she says her inspiration comes from her love of dogs and flower gardens. She is also inspired by artisan Lampwork beads, and the many super talented and crafty artists she has discovered through Etsy and the world wide web. In addition, she is inspired by color but says she loves all colors equally. Besides creating her wonderful jewelry, Eva enjoys watch foreign & indie films and documentaries. She is an avid fan of Brazilian Jazz, Jazz, Acid Jazz, Nu-Jazz, Electronic, Lounge, World Music, Alternative, and funky pop. Her current favorite food is Wild Salmon but that is subject to change. According to Eva, the single word she would use to describe herself is *nerd*! Thank you so much! :o) Great job on your first one!